To say it’s a game-changer would be the understatement of the year. In recent years, depression had become more widely understood. This has been, in many ways, fantastic for those of us who suffer from what is sometimes referred to as “the black dog.” At other times, it can be frustrating, because there’s more to depression that people outside it first suppose. Everyone is familiar with the numbness, the crying and the suicidal thoughts — the head stuff, if you like. Those of us stuck with it also know there’s more to it than that, but it’s difficult to know exactly what. I’ve had depression all my life and I had no idea some of these things were so strongly related to my condition, until, well… my meds started working. It makes it a lot easier to like yourself when you find out that you aren’t as lazy, scatty, or clingy as you may appear. So, for all those people with a vested interest in depression and those of us who suffer from it, here are the things I couldn’t do until my meds started working. Depression messes with your concentration. It never occurred to me that the reason I couldn’t read more than a page or so at a time of any given novel had more to do with my depression than my dyslexia. I thought I was just too slow at reading, then my meds worked. I couldn’t shake the feeling of the world closing in. If I couldn’t see anything at all, I would start to hyperventilate. I hated the isolation. At my lowest point, I suffered auditory hallucinations. On top of that, my chemicals were so out of whack that I didn’t need darkness to sleep anyway, I just needed opportunity — not even comfortable opportunity. I’ve slept in lecture theaters, face down on computer keyboards, and even once in a supermarket. Now, it’s a different story. I have to have low light and take my time to drop off. Being able to read more than a page or so really helps. I thought I was a champion sleeper, then my meds worked. It’s incredible how easy it is to make a mess when you’re severely depressed. My room was so often under a foot of laundry that my partner used to joke I didn’t need carpets. I knew it was ridiculous, but I just couldn’t seem to stretch the extra inches to drop my dirty laundry into the washing basket. My partner would round it up and wash it. I know what you’re thinking: how spoiled, I wouldn’t do that for my kids, but honestly, I’m too old to cover up smells with body spray, and that’s what I had started doing. Then, my incredibly patient partner would put my clean clothes in a pile on my bed. All I had to do was pick up the piles, turn ninety degrees and put them in the drawers. That was too much. My clean clothes would end up on the floor, mixing with the dirty ones, and the mugs, plates, empty drinks cans, and other crap that would pile up because it was too much to take anything downstairs. It was horrid. I thought I was just a slob, then my meds worked. I’ll be the first to admit I’m hooked on the internet. Most people have a somewhat unhealthy connection with their phone these days, either because of Facebook, Twitter, eBay or whatever. This wasn’t that. This was an honest to goodness terror of being disconnected. I was totally afraid of being alone, not being able to contact friends, even if only briefly. Quick texts became a mainstay of my coping mechanisms. Just the ability to reach out and make human contact with someone, if only to receive a smiley in return. It helped a lot, on the odd occasion it actually got me through a dark thought or two. Knowing that is probably why I was so scared of being without it. I couldn’t go about more than 15 minutes without checking my phone, then my meds worked. I actually quite like really cold water. We have it freely accessible at work. All I had to do was fill my bottle, then fill my face. This was too much for me. Sometimes, I’d get to supper time having drunk nothing. I’d just about manage some soda at dinner time, or maybe some fruit juice. It didn’t matter how much my partner nagged. She would hand me glasses of water, I’d take two sips, put them down, and they’d sit untouched. They still do some nights, but that’s because I’m no fan of our village water supply. My constant dehydration probably added to the problems I was having with my mental health. I just couldn’t see it. I thought the whole benefit of hydration was a myth, then my meds worked. There’s a lot of white noise in your head, and when you’re depressed it hates you. It goes on and on about things that it knows will upset you. If it’s not one thing, it’s another. I found that if I blocked the noises with music, films, anything at all, then I wasn’t likely to have a meltdown over some bullsh*t thing my head was banging on about now. It takes its toll, constantly having noise is exhausting of the senses. Silence is restful, it’s good for the soul. I wanted to love it but I couldn’t stand it, then my meds worked. I still have bad days, and sometimes these things come back and bite me on the proverbial, but now I know what causes them I can deal with them. I didn’t write this article to crow about my meds… well, not just that anyway. Hopefully, it’ll shine a bit of a light for other people stuck with the same subtle, yet pervading physical symptoms of the dreaded depression. 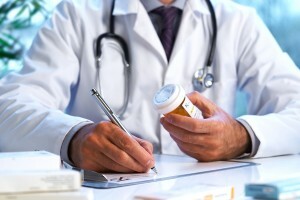 This guest article originally appeared on YourTango.com: 6 VERY Unexpected Side Effects Of Finally Going On Antidepressants.